A term used in the United States to describe a brake van. The Central Australia Railway extended from Port Augusta through Quorn and Marree to Alice Springs (originally called Stuart until the name changed on 26th January 1932). It was narrow gauge. The railway was originally built to Oodnadatta by the South Australian Railways and transferred to Commonwealth ownership on 1st January 1911. 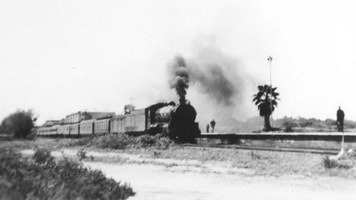 The South Australian Railways continued to operated the line until operation was taken over by the Commonwealth Railways from 1926. 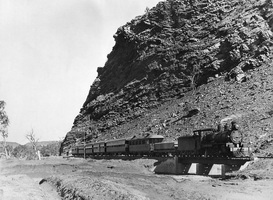 In 1926 construction began on the Oodnadatta to Alice Springs section of the line, a distance of approximately 292 miles. The line opened to rail traffic on 2nd August 1929, with the first passenger train arriving shortly after 2pm on 6 August. It had been scheduled to arrive at 9:30am. The old Central Australia Railway was replaced by the Tarcoola to Alice Springs Railway in 1980. See Commonwealth of Australia Land Transport Board. (C.L.T.B.) The Commonwealth of Australia Land Transport Board was formed during World War II to control the movement of Transport in Australia. It was responsbile for providing various rollingstock items to the Commonwealth railways on loan to facilitate the war effort. The "Commonwealth Railways" were owned the Commonwealth of Australia. They were set up initially to operate the railway from Port Augusta to Kalgoorlie (Trans-Australian Railway), but eventually took over the operation of the line to Alice Springs (Central Australia Railway) and Darwin (North Australia Railway) lines as well. They were amalgamated with the "South Australian Railway" in 1975 to form "Australian National".